Our flexible baseboards are made from a polyurethane resin, and are flexible enough to wrap in a full circle that has a radius of at least 3x that of the thickness of the profile. Flexible baseboards can join up to existing wood baseboards, so you only have to use the flexible baseboards in the length of the curved wall or staircase. 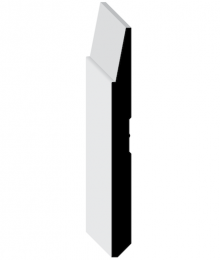 Our quick ship baseboards are stocked in 8 foot lengths. These can be cut down on site to fit the area of application. Should you require a few extra feet, we can have the baseboard made for you in the length(s) you require (please allow 2-3 weeks for production and inbound shipping). 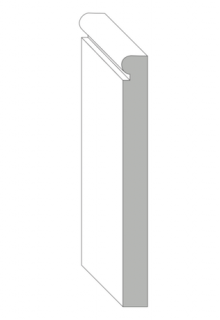 The flexible baseboards are ordered straight, with no radius, as they will not be arching. Should you require an arched baseboard for a custom project, please contact our sales desk for assistance on how to order. The Quickship baseboards listed here are usually in stock and ready for quick shipping any where in North America the same day. For other custom baseboards (profiles and sizes), you can choose from the hundreds of profiles listed in one of our catalogues. If you are trying to match an existing rigid profile, you can send an email to sales@elitetrimworks.com with the size and picture of the baseboard, and we will be able to determine if it can be produced (exact or similar), or whether it will need to be tooled to replicate. For custom orders, please allow 2-3 weeks for production and inbound shipping.